La Trobe’s Smart Energy Management system was unveiled as part of Australia’s first Zero Carbon Emission House on April 29 in partnership with the CSIRO, Henly properties and Delfin Lend Lease. 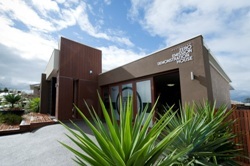 The Zero Carbon Emission House is fitted with La Trobe University’s unique Home Energy Management System created by La Trobe’s Centre for Technology Infusion. The system tracks energy, water use and supply and the information it gathers will be used in a twelve-month trial on the living effects of the average family by the CSIRO. Using touch-screen displays as well as smart management and control technology, the system makes householders more aware of their consumption patterns. This empowers them to take action to reduce energy use, thereby minimizing their household’s carbon footprint. All energy and water use information that is displayed in the house on the touch-screen can also be accessed remotely via the internet or mobile phone. La Trobe University is a partner in the Australian Zero Emission House (AusZEH). The project aims to provide Australian families with affordable and sustainable homes, reduce greenhouse gas emissions by the housing industry, and spearhead technological solutions for possible export markets.